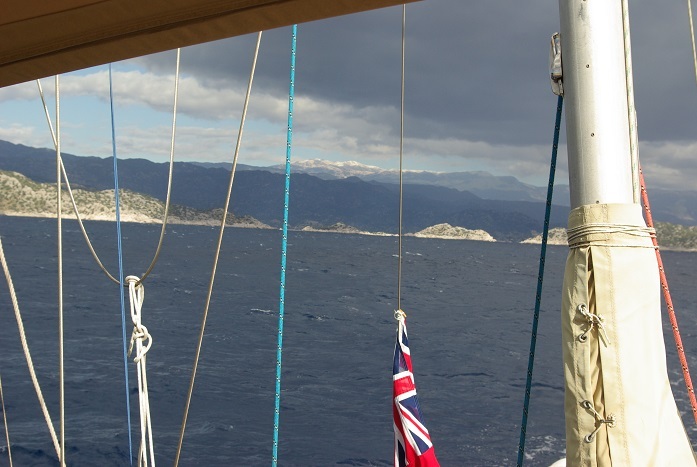 Proceeding in leeward of Kekova island we decided to head for Kas in open ocean. When leaving the protection of the archipelago we came out to winds of around 20kts and beamseas. The first hour was reasonably comfortable allthough beamseas clearly gives a more uncomfortable ride. After an hour winds increased and the question was wether we should set the paravanes. From the sea the top of the mountains are clearly visible with tops dressed in snow.